The Michelle Nicolle Quartet is critically acclaimed as one of the most prolific and inventive jazz ensembles in the country. Continuing the beautifully successful concerts in the Melbourne Recital Centre Salon, playing the music of Mancini (2012) and Jimmy Van Heusen (2013), Michelle is taking the 'Mood Indigo' theme quite literally – performing songs by the great composer: Duke Ellington. The music of Edward Kennedy "Duke" Ellington (April 29, 1899 – May 24, 1974) is an essential part of the rich culture of “jazz” genre, yet Ellington himself preferred his music to be known simply as “American Music”. With a recording career of 50 Years it is nearly impossible to narrow his vast catalogue into one set of favourites. Ellington and his faithful collaborator, William Thomas "Billy" Strayhorn (November 29, 1915 – May 31, 1967) wrote so many songs which endure and are loved by generations. As an improvising musician and singer Michelle has always been drawn to the perfect balance of intricate, yet memorable melodies and poetic, eloquent lyrics. So, to choose the repertoire for this concert, Michelle had to go with her heart and arrange the great songs which move her the most. Australia's first lady of Jazz - Winner: 2001, 2003 and 2004 - Australian Jazz Vocalist of the Year MO Award - Michelle has released 8 beautiful albums, all of which have been received with high acclaim. Her CD 'Mancini' (2012), presents the climbing of jazz vocalism to a maturity that's not only unsurpassed in Australia, but is truly of world class and easily holds its own in the ranking with the top jazz female jazz vocalists on the international jazz scene today. "But it was Michelle Nicolle who stood out, combining emotional honesty with an improviser's instinct ..."
As part of the Melbourne Recital Centre's annual American Songbook series, Australia's leading jazz vocalist Michelle Nicolle will again this year feature with 3 concerts in the Salon on 21 and 22 June, singing with her Quartet the repertoire of Jimmy van Heusen. One of the giants of the Tin Pan Alley era, Jimmy Van Heusen wrote some of the most enduring songs from the late 30’s through to the 1960’s. Winning Academy Awards and sung by some of the greats including Frank Sinatra, Ella Fitzgerald and Bing Crosby, his beautifully crafted songs include All the Way, Swinging On A Star, Come Fly With Me, But Beautiful, Like Someone In Love. Since 1999 The Michelle Nicolle Quartet has been critically acclaimed as one of the most prolific and inventive jazz ensembles in the country. For these three concerts they will continue on their endless mission...reimagining the great songs from The American Songbook. "Australian jazz singing doesn't come any better than this." Australia's first lady of Jazz - Winner: 2001, 2003 and 2004 - Australian Jazz Vocalist of the Year MO Award - Michelle Nicolle is Australia's first lady of jazz. Michelle has released 8 beautiful albums, all of which have been received with high acclaim. Her new CD 'Mancini' (2012), presents the climbing of jazz vocalism to a maturity that's not only unsurpassed in Australia, but is truly of world class and easily holds its own in the ranking with the top jazz female jazz vocalists on the international jazz scene today. Michelle's vocalism is of a quality and calibre that's long been recognised by jazz festival audiences and critics in Australia, Europe and Asia. With the beautiful 'Mancini' renditions Michelle Nicolle gives us the finesse, the quality of phrasing, and the vocal range at a level not possessed by another jazz repertoire vocalist in Australia, and indeed is held by only a hand full of singers in the jazz world today. Michelle Nicolle has toured Australia and internationally multiple times at International Jazz Festivals, and in July 2012 presented Australia at the AP International Music Festival in Russia. 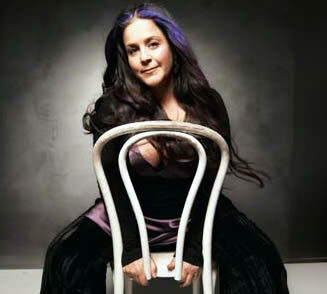 Winner: 2001, 2003 and 2004 - Australian Jazz Vocalist of the Year Mo Award - Melbourne based, arranger, band leader and jazz vocalist Michelle Nicolle - www.michellenicolle.com - is Australia's first lady of jazz. With her full ranging and marvellous voice, her profile has been rapidly rising and Michelle has become known as Australia's finest jazz singer. Michelle has released 6 beautiful albums, all of which have been received with high acclaim. Her 6th CD 'The Loviest Night' is out on ABC Records. In 1998 at the Wangaratta International Jazz Festival (Melbourne), Michelle won the prestigious National Jazz Award and the judges included the legendary bebop singer Sheila Jordon (USA), and the current Blue Note vocal star Kurt Elling (USA). - "Australian jazz singing doesn't come any better than this" - (The Weekend Australian). During the past 10 years Michelle Nicolle and her band have toured regularly around Australia and performed internationally at major festivals in Japan, New Zealand, South Korea, Singapore, Indonesia, Thailand, Malaysia, Taiwan, Turkey, The Netherlands, Finland and Estonia. When invited to create a program for the American Songbook Series, Michelle Nicolle immediately responded: "Well it just has to be Mercer and Mancini". Why? Moon River says it all. The gorgeous, Oscar-winning song was penned by lyricist Johnny Mercer and composer Henry Mancini for Audrey Hepburn to sing in Breakfast at Tiffany's. Moon River epitomises the very best of the American song-writing tradition that stretches back to Gershwin and earlier. Moon River was one of the few collaborations between this pair, but between them they are responsible for thousands of entries in the American Songbook - Mercer was as accomplished a composer as he was a wordsmith. Michelle and her band will survey hits like Days of Wine and Roses (another Mancini/Mercer collaboration), That Old Black Magic (Mercer), Moonlight Sonata (Mancini), in a loving tribute to two geniuses' work together and apart. Mancini was also the favourite composer of one of Michelle's influential Adelaide University teachers, the late jazz pianist/educator, Eric Bryce. Winner: 2001, 2003 and 2004 - Australian Jazz Vocalist of the Year Mo Award - Melbourne based, arranger, band leader and jazz vocalist Michelle Nicolle is Australia's first lady of jazz. With a full ranging and marvellous voice, her profile has been rapidly rising and Michelle has become known as Australia's finest jazz singer. 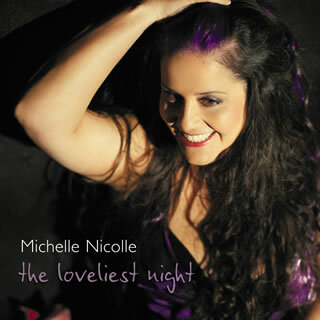 Michelle has released 5 beautiful albums, all of which were received with high acclaim, and her 6th CD 'The Loviest Night' will be out on ABC Records at the end of March 2009. In 1998 at the Wangaratta International Jazz Festival (Melbourne), Michelle won the prestigious National Jazz Award and the judges included the legendary bebop singer Sheila Jordon (USA), and the current Blue Note vocal star Kurt Elling (USA). - "Australian jazz singing doesn't come any better than this" - (The Weekend Australian). 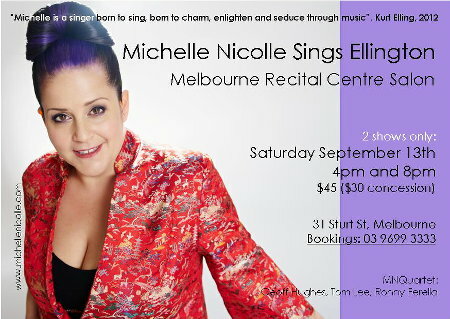 In 2003 and 2006 Michelle Nicolle toured around Australia and in 2004 she toured Korea, Taiwan, Singapore and Thailand. In 2005 the Michelle Nicolle Quartet featured at the Java Jazz Festival in Indonesia and performed at the North Sea Jazz Festival in Holland, as well as at Singapore's Ozmosis Festival. In 2007 tourings included New Zealand, Turkey, Estonia, Finland and Singapore, and in November 2008 the JakJazz festival in Jakarta was included in Michelle's international touring destinations. "..I can think of no one else who finds, in the modern jazz repertoire, such a sense of pure song." Gilbert Haisman, Evening Post, NZ, Oct'01. Australia's first lady of jazz - That's Michelle Nicolle. Mo Award winner 2001, 2003 & 2004 (Australian Entertainment Industry), National Jazz Award (Wangaratta Festival of Jazz 1998) winner and A.R.I.A Finalist 2001,2004 (Australian Recording Industry), Michelle Nicolle is a jazz musician whose chosen instrument is Voice. Also a superb arranger and band-leader, Michelle Nicolle, with 5 beautiful albums is celebrated as Australia's finest jazz singer. In April and May the Michelle Nicolle Quartet will perform at 3 international jazz festivals in New Zealand, Estonia and Finland. An important feature of the 3 week tour will be an Australian jazz showcase presentation as part of the Australian government’s Anzac cultural program in Turkey with concerts in both Ankara and Istanbul. "This project has been assisted by the Australian Government through the Australia Council for the Arts, and the Department of Foreign Affairs and Trade, Cultural Relations Discretionary Grant Program"